Of all the things to ban at school, who was responsible for this terrible idea? How can you ban children from bringing a home-made lunch to school? How can you force parents into spending money for their child’s lunch when they could provide their own for less cost? This is another case of we don’t trust parents and their children, so we’ll intervene. Whilst this philosophy is often generated from good intentions, it seldom leads to good results. The days of brown bagging it are over for students in a Chicago school. In an effort to encourage healthy eating, their principal banned lunches brought from home. Elsa Carmona, principal of Little Village Academy on Chicago’s West Side, forbade students from bringing food from home (except those students with a medical excuse) after she noticed kids eating “flaming hot” chips and drinking soda at lunchtime. “It’s milk versus Coke,” she said. While the goal of healthy eating is a positive one, parents are understandably upset about the Carmona dictating what their kids can and cannot eat for lunch. Not to mention the fact that some parents may be able to send their kids to lunch with a meal that costs less (and one that could be even healthier) than the school’s offerings. The kids are upset, too. When the Tribune reporter visited the school, one seventh grader led students in a chant of “We should bring our own lunch! We should bring our own lunch!” Students say the school’s food tastes bad. 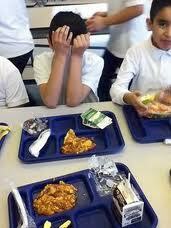 Bad-tasting food, parents say, often means that kids throw away the school lunch and go hungry. It’s also worth noting, as reported by the Tribune, that the school district receives money from the federal government for each free or reduced-price lunch it serves, meaning that in banning homemade lunches could potentially put more money in the pockets of both the district and the school district’s food provider. Is anyone surprised that this scheme looks very much like a money-making venture disguised as a realistic attempt in tackling childhood obesity? What happens to a child who is caught bringing in a lunch from home that is more healthy and nutritious than what the school offers? Does that child get punished? What happens if the students hate the menu? Why should they be forced to eat what they don’t like? I am all for reducing the amount of junk that students have in their lunch boxes. But at the end of the day, I urge school’s to stop mirroring prisons. Yes discipline is important, as is routine. And yes, at times intervention is required. But why do those involved in forming school policy show a lack of regard for making their students’ time at school a happy, comfortable or at the very least bearable experience? How about forcing those involved in making stupid rules like this one to eat from the school cafeteria? How about making them lead my example and banning them from eating a home-made lunch? And you wonder why there is such a lack of respect from students nowadays? This entry was posted on April 15, 2011 at 12:29 am and is filed under Childhood Obesity, Nutrition, School Rules. You can follow any responses to this entry through the RSS 2.0 feed. You can leave a response, or trackback from your own site. Don’t even tell me! As a parent who is super-conscious about nutrition and whose child has, since the age of three, been asking for grilled salmon instead of chicken fingers and fries at restaurants (much to the amusement of waiters), I am incensed that schools think they’re going to feed my kid better than I do. Plus, can I just say that the schools have no freaking idea what good nutrition is. Have you looked at their menus? Jeez. Yes, I agree, this looks like it is A LOT more about money and profit instead of nutritional health. Usually things are not what they seem. Like in Wisconsin, where the Gov purposefully gives major tax breaks to corporations, then says there is a deficit problem and needs to get rid of the teachers unions. They’re making parents pay for school lunches? Yeah right, this is not about nutrition.